What Makes A Good Wheelbarrow? 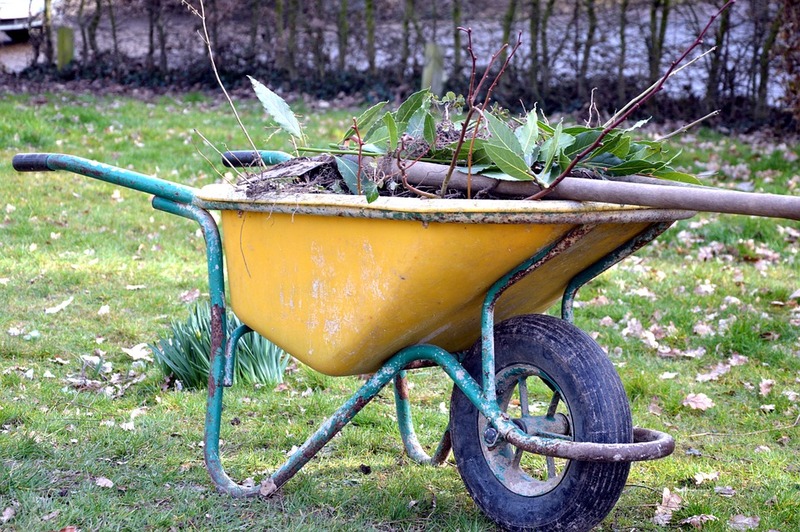 A wheelbarrow is one of the most crucial tools that every gardener and landscaper must have. The two rear handle-wagon gets its name from the old English word ‘bearwe’ which simply means a tool for carrying loads. Anyway, I’m sure you came for the best wheelbarrow reviews, and so, I won’t waste any chance. So, which is the best wheelbarrow ever? What’s good for the price and how can you get it? Well, we hope that by the time you are done reading this post, you will already have answers to all your queries. Shall we? This is one of the most contested topic to handle. It’s pretty much the same as asking who between Maradona and Pele were the world’s best soccer players- or, recently, Ronaldo and Messi. However, modern wheelbarrows are clearly better than those used in the wheel age. Every day, the sophistication and ergonomic features continue to improve. Different civilizations in the world had their unique ways of carrying heavy loads. The European wheelbarrow, for instance, had one wheel at the front. On the other hand, the Chinese had their wheel at the middle. The Chinese version was definitely efficient as it could carry more weight with ease. The European barrow, on the other hand, laid much emphasis on the user’s strength as opposed to the tool itself. The Chinese cart had all its weight at the center where the wheel was located. Thus, it required less strength to operate than the European. So, can we now declare the Chinese barrow as the best ever? Well, that depends- it was the best at the time. Today, manufacturers have combined the best from both wheelbarrows and blended it with modern designs to create the so called ‘best wheelbarrows ever’! Do you love gardening? If yes, then there is every reason to have a personal wheelbarrow. You may not find it worthy if all you have is a small kitchen garden. But, if you are dealing with a larger plot of land or a yard, then you will find it necessary. A standard wheelbarrow is useful as it makes it easy to lift heavy loads in a simple way. It’s crucial in commercial, farming and landscaping. Here’s some of the uses of this essential tool. It is useful in moving compost, gravel or heavy soil. Construction workers also find the wheelbarrow necessary in their wok. Farmers need it for gathering, harvesting, planting as well as spreading fertilizer. Animal keepers will need it when cleaning sheds. By now, you know how to choose the perfect wheelbarrow for your job. So, which is the exact wheelbarrow you should buy? Well, it can be tempting to be bias on this, but we believe in using a clinical system to arrive at the answer. Every person has their preferences and so, we cannot objectively rely on opinion alone. That’s why we’ve scoured the stores for you, and then brought you the finest brands that we’re sure you will love. Remember, all our reviews are based on how well these wheelbarrows perform among other important considerations. Now, below are our picks for the top top rated wheelbarrows. WorX is one of the world’s most renowned manufacturers of power tool. You can check out our review of the best Worx chainsaws for the details. And, it seems that they have remained true to their excellence when designing this wheelbarrow. No doubt, it’s my choice- and after you take a good look at its flexibility, versatility and performance, I believe you are going to understand why! First, this is a highly versatile best steel wheelbarrow with a first class lifting and moving system. It’s one of the few tools that you can be converted into other tools. For instance, it’s a barrow, but you can change into a dolly or other things. They boast with the line ‘don’t break your back or the bank’. Apparently, you can use their accessories (which are available at their distributors everywhere) to enhance flexibility without needing to buy any other tool. So, instead of having a cart and wheelbarrow at the same time, you had better settle on the Worx Aerocart Multifunction. Second, it works on flat-free tires. These may not be the best for people who have soft grounds and terrains. However, they are ideal for those who don’t want to spend their time inflating tires every time that they need to put the yard in order. If you are a fan of pneumatic tires, then you can easily install them onto your aerocart. Third, it has a patented design that adjusts the center of gravity. This makes it easy to balance the barrow when it is in operation. Plus, it prevents toppling of the load. Fourth, it is multifunctional. This is one of the main reasons why the double wheel wheelbarrow has a high customer rating on all the online outlets. You can convert it into a bag holder, mesh rock mover, cylinder holder and flower pot strap. It comes with those accessories. The good thing about it is that you do no need any sophisticated tools or skills to adjust the accessories. Fifth, it has a dual wheel steel wheelbarrow construction. The weight capacity is 300 pounds 3 cubic feet volume. Do you love vintage? Well, now, think of a classic cart with two spoked wheels and a great performance. Basically, that’s what the Polar Trailer 8376 Utility Cart brings you! In brief, it is designed to provide a durable, rugged and simple tool for hauling stuff at home. It’s one of the best wheelbarrow for gardening, literally. The two wheeler will enable you to carry grass clippings, game, dirt, rocks, firewood, camping gear and flower pots among others. Find a detailed Polar Trailer 8376 review below. First, it is designed for home use and you can use it for the yard, garden, farm, dock and general hauling. The construction makes it easy to carry stuff around the home. Second, it is sturdy and has a weight load capacity of 400 pounds. Well, it’s not entirely metallic as the tub is made of polyethylene. However, it can withstand weights as long as you don’t overwork it. Third, the barrow has a centered and balanced axle. This makes hauling easy as the load’s weight is distributed to both wheels. Again, you don’t need to use much strength to move it even on rugged terrains. Fourth, it has two well-designed 20-inch spoked wheels. The large diameter makes hauling easy as they are more efficient and you don’t need to exert a lot of power to move the barrow. The wheels have solid rubber tires- you don’t need a pump! If you are looking for the best wheelbarrow for construction and contractors, then you should add Jackson M6T22 to your list. That doesn’t limit its use, though. You can have it for gardening and farming activities and it will still perform excellently. In brief, this wheelbarrow is simple to use, and is basically a standard barrow. It is one wheeled with wooden handles and a steel tray. The design plus pneumatic wheels make the barrow comfortable and easy to use. Below, find a detailed analysis of Jackson M6T22’s features. Whenever you are looking forward to buying a barrow, always be sure to check on its balance and strength. Remember, this is a tool for hauling loads and you don’t probably want to topple over or break it. Jackson M6T22 is design with a low center of gravity to improve the balance. It is also made of heavy duty wooden handles. Some people prefer metallic handles as they seem to be more rugged and durable. But, it’s not always the case. Most carts with iron levers are non-ergonomic and they are prone to breaking as much as any other material. The wooden handles are built to last- and they will as long as you carry the appropriate load capacity. The wheel and tray are designed to last and harness easy hauling. The 16 inch wheel is pneumatic and it has a strong tube and tire. Further, the tray is made steel and it is heavy duty gauge. Not only will it last for long, but also support heavy loads. 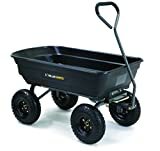 When you need to haul large and heavy luggage, it is important that you find a wheelbarrow that can support the weight. Sometimes, you can look for a cart or trolley instead. Gorilla Carts GOR4PS is one of a kind in this category. It has a new frame design that helps you when offloading. It has four pneumatic tires and a height of 19.5 inches. Overall, it weighs 32 pounds only which makes it ideal for hauling stuff at home. If you are looking for the best light wheelbarrows for domestic use, then I suggest you should give this one a shot. Anyway, let’s get to the details. First, the cart has a patented design that makes it easy to load and offload. It’s similar to hydraulic press trucks; it lifts the tray and pour out the load in an easy way. In the same way, the trolley lets you offload without having to bend or overturn the tool. Second, it runs on 4 pneumatic wheels. I’ve mentioned earlier that the number of wheels on a barrow dictate how the weight is distributed. Gorilla Carts GOR4PS’s four wheels allow you to burn little calories when hauling stuff. Again, the 10-inch inflatable tires make it light as you maneuver through rugged terrains. Third, it has a sturdy design. The poly bed supports up to 600 pounds. This is further facilitated by the rugged steel frame whose design reduces time needed for assembly and increases maneuverability. What can (can’t?) you do with a 6 cubic feet wheelbarrow? Well, this is one of the finest brands in the market today. It’s definitely not like the usual standard barrows you have come across. It’s large, four wheeled, stable and ergonomic. Interestingly, it is affordable and you may like how well it works. The best heavy duty wheelbarrow with big 4 Wheeler is one of the best commercial wheelbarrows and you may find it worthy for you factory in the next few seconds. However, it doesn’t come without its cons. Below is a detailed review. First, it has a four wheel system. In our buying guide above, we saw how the number of wheels distributes the weight of the load and thus influences the balance of the tool. Now, this barrow has two rear wheels and two at the front. This promotes zero load shift. Again, it is easy to carry loads as you don’t really have to use much strength. You neither have to be experienced in operating it nor do you have to be a body builder. If you are transporting stuff on a flat surface, all you need to do is push! Second, the pneumatic wheels promote durability and ease of operation. They are designed to last as well as make it easy to operate the wheelbarrow. Spares are available at local stores. Third, it has a heavy duty construction. The suspension of the Big 4 Wheeler is designed to support large weights. In theory, the suspension makes loads look lighter. You can carry more weight on a Big 4 Wheeler than you can carry on ordinary one or two-wheeled barrows. The construction works with the multiple wheels to prevent spills and maintain balance. Fourth, the wheeler’s tray is large and durable. The plastic basin can hold 6 cubic feet- including liquids. This makes it ideal for farm and construction work. However, the plastic may not be as good as the steel tray. Fifth, it has a patented ergonomic design. The brand is majorly design for home, farm and commercial use. The design is therefore necessary for preventing spills and back injuries. Sixth, it has strong wooden handles. This makes it lighter than the metallic varieties. It’s also ergonomic. Sometimes, you want a big best wheel barrow. Well, this is a bigger variety of our number #5 above. All features are the same apart from a few we’d like to cover in summary. The plastic tray can hold up to 6 cubic feet, including liquids. It is also weather resistant and does not rust. The brand also lets you choose the 10 cubic feet tray which is large enough for commercial use or large scale domestic purposes. It has 4 wheels which not only create a balanced movement of loads, but also improve stability and simple operation. The ergonomic design and ease of operation will reduce any chances of injuring your arms, legs, back and shoulders. It is ideal for large-scale home use of commercial purposes. Like in the 6 cubic feet variety, this brand has pneumatic tires that go flat easily. However, you can always opt for the airless tires. Buying a garden wheel barrels can be a tiresome activity especially if you are not conversant with the right specs to look for. The good thing with us is that we reviews wheelbarrow styles to suit you. We understand that not every cart or barrow out there is the best for you. So, we ensure that we’ve got one for every person. Whether you are a gardener or landscaper doesn’t matter. Again, we won’t mind if you are a small or large scale farmer. We’ll spoon-feed you with the information that can enable you to make the right decision. Here are the considerations you need to make when buying the best wheelbarrows. This is the size of the tub and it is measured in cubic centimeters or feet. A tub with high cubic feet means that the wheelbarrow can carry a large load. If you need to carry a lot of stuff in a go, then you should pick the wheelbarrow variety that has a large capacity. However, it’s important to understand that a wheelbarrow with a large capacity will not necessarily carry more weight. The weight that it can carry depends on lots of factors including the number of wheels, your strength as well as its design. If you want to haul a lot of stuff at once, go for units with about seven cubic feet. Wheelbarrows with three to five cubic feet volume are standard and ideal for people who do average gardening chores. The majority of wheelbarrows have either the solid rubber or the pneumatic tires. The rubber tires never get punctured or go flat under any circumstance. However, if the terrain is soft, they leave a trail of marked lawn. Again, they may be hard to push on such grounds. On the other hand, the pneumatic tires are those that require pumping. They are air filled and this makes them lighter and they provide a smooth ride. It’s easy to push them even when they carry heavy loads. The downsides include the need for regular pumping. Their tires are just like those of a car- when they go flat, you cannot ride them. Again, they can be punctured by sharp objects. Further, those with large diameters are better to use ‘off the road’ than those that are narrow. This is because the narrow variety is harder to push. You have probably witnessed a situation where a farmer is pushing the wheelbarrow only to have it topple over. This is a common happening and it sparks the debate of whether we should have one or double wheel barrow. If you decide to put your money in the one wheel, then you should be ready for its pros and cons. It’s important to appreciate that the one wheel barrow is easy to maneuver and empty the load. However, you should be ready to use more strength when operating it. Again, it relies on one wheel as the pivot and this means you will need to keep up your balance. The dual wheel wheelbarrow variety solves the balance issue. However, it will not be easy to maneuver it as you have to keep both wheels in position. Again, it’s not the best for hilly or uneven terrains. The handle acts as the ‘control panel’ for the wheelbarrow. You use it to direct the tool as well as regulate its speed, power or direction. Traditional varieties have a pair of handles- one on each side. However, modern units have a single handle that curves around. It is easy to empty, tilt and control with separate handles. But, you need a substantial amount of hand strength to use such tools. Again, you cannot possibly operate it with one hand as the balance depends on how well you use both hands. Then, the closed handle variety is not as maneuverable as the separate-handle barrow. However, it is ideal for users who do not have robust hands. You can also use one hand as long as the load is light enough and evenly balanced. Wheelbarrows come in two types of trays. The first one is plastic, while the other is metallic. The type of wheelbarrow you purchase will guide the price, performance and longevity. The standard wheelbarrow is a two-handled tool with a single wheel at the front. The majority of standard wheelbarrows are made of steel or iron, although we do have others that are plastic. The metal variety is usually heavier, noisier and stronger than the plastic. But they are also heavier and fashioned for hard, heavy loads. If not protected, the iron may rust. Then, the plastic models are lighter, cheaper, quieter and weather resistant than the metal varieties. Most of them fall in the list of the best wheelbarrow under $100. They are fashioned for light loads and they aren’t as durable as the metal varieties. The shape of the nose dictates how you can empty the wheelbarrow. Some units have flat while others have the rounded nose. Round noses allow you to empty the tub from any angle. However, you can only empty the flat nose tub by tipping the wheelbarrow forward. Weight capacity is the maximum mass of load that a unit can carry. If you are going to use yours at a construction site, then it is likely going to be engaged in heavy-duty work. At such a time, go for the tools with a high weight capacity. At the same time, you should look for those with a lightweight wheel barrows if you are only going to use it for simple gardening activities. Fortunately, they have the manufacturer’s seal with the capacity inscribed. So, you are spared of the pesky Newtonian calculations. We understand how it feels to be lost for choice. Well, with our analysis on the specs that should guide you in buying the best yard wheelbarrow for your situation, we believe it will be easy to find the perfect model. But, first time buyers may still difficult to pick one and leave the other. Noteworthy, the online stores have hundreds of brands for sale and this may be a little confusing. That’s why we find it important to explain a few things a little more than just listing them down. So, after you have settled on buying a wheelbarrow, and even found the type that is best for you, you can use a few considerations to make the final decision. These include construction, color and price. Find out what type of material is used for the construction of the barrow. Plastic wheelbarrows cannot outlive iron or steel. Again, the kind of construction will guide you to the price. Simply built barrows tend to be cheap. What amount of load do you intend to be carrying. Or rather, for what purpose are you buying the barrow? Some units will support large weights and some won’t. High weight and volume capacities are for large-scale workloads. It’s always important to live your means. Fortunately, there are several kinds of carts and wheelbarrows for your need. In our review, you may even get the best wheelbarrow under $100! Have you found your match for the best gardening wheelBarrow already? I hope you have. Well, the ‘best’ of anything is always a contentious topic to handle. Some people have a bias towards items that they have used before, or those that they like. But, the surest way to know which item deserves to occupy the apex of the ranking is to be clinical. That’s what we do- we don’t just rely on skin-deep commercial ads. We research widely and test our findings to bring you the best products that the market has. 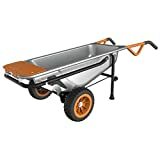 In our analysis, it is fair to state that the best wheel barrow is the Worx Aerocart Multifunction WG050. I honestly like the Polar Trailer 8376 Utility Cart more due to its elegance. But, you see, the aerocart is crafted in one of the most modern designs. It’s like having three home tools in one. Thus, the Worx aerocart outclasses any other wheelbarrow I have seen so far. Which one do you consider to be the best?